I remember not having cable for long periods of time when I was growing up. It was torture listening to the kids at school talking about all the programs I was missing. So, when I got out of the house, I immediately subscribed. But when I got into my 30s, things changed. I got married, bought a house and had kids. Suddenly, I didn’t have endless hours to stare at the TV, but what I did have was a ton of bills. So the decision to cut the cord was pretty easy for me. Sure, there were a few shows my wife and I tried to keep up with, but that was secondary. I did the research and wanted to save. In all, I’ve saved $50 to $100 per month over the last two years. That’s somewhere between $1,200 and $2,400 overall back in my pocket. However, like many others looking to cut the cord, I was scared I’d miss out on live sports. In particular, the most popular sport in the U.S.: NFL football. As it turns out, there are plenty of ways to get all the football you can handle without having cable. Want to catch this NFL season without an expensive cable contract? Let’s take a look at the best options at your disposal. If you’re a fan of the local team, the easiest way to watch is with an antenna. That’s right, even your parents’ old bunny ears probably still work. However, I opted for a newer, sleeker model — the Mohu Leaf 50, which runs around $30 on Amazon. It worked well in my area, and my wife liked the way it looked. A win-win. Of course, there are plenty of other antennas on the market — you’ll need to find one that matches your needs. I recommend heading over to TVFool.com and running a report to help you decide. If you have trouble digesting the site, this subreddit is a good guide. If you live within range of the big four networks’ (CBS, Fox, NBC and ABC) over-the-air signal, you’ll be able to pick up every one of your local team’s games for the season. That’s a lot of football. For free and in HD. More than enough for the average fan. If you’re a diehard fan, you’ll probably want more coverage. And that means you need cable networks like ESPN or NFL Network. While both of these used to be cable exclusives, you can now get them without a contract through a few streaming services. First up is Sling TV, which I personally use to watch sports online. Sling offers various skinny bundles of channels to livestream over your internet connection. If you want to get the stream on your TV, you need a device like a Roku or Apple TV. The Sling Orange package comes with ESPN, which means you can watch Monday Night Football each week, along with all of ESPN’s NFL coverage. It’s the cheapest skinny bundle you’ll find at $20 per month. However, if you’d rather not listen to ESPN talk about Tim Tebow half the time even though he’s no longer in the NFL, you probably want NFL Network. Not only does this station give you 24/7 football coverage, but it also broadcasts most Thursday Night Football games. You can get this as part of Sling TV’s Blue package for $25 per month. Or if you need both Sling Orange and Blue, you can subscribe to both packages for $40 per month. The NFL regular season is four months long, so you’re looking at $160 to get you through the season. Of course, keep in mind that you aren’t just getting the NFL. That $160 per month is pretty much a cable replacement with channels like AMC, USA, CNN and more. There’s no commitment, so you can cancel whenever. You can also try Sling TV free for seven days. Your other option for both ESPN and NFL Network is PlayStation Vue. The service is pretty similar to Sling TV. You pay month to month, and you get to stream cable channels to various devices. And you can cancel whenever you want. The starting price is $39.99. The base package gives you ESPN and a bunch of other channels, but you have to upgrade to the $44.99 tier if you want NFL Network. Of course, if you’re really looking to save money, you could consider borrowing a cable login from a friend or family member. Depending on their cable package, this could give you access to the NBC Sports app, FOX Sports Go, WatchESPN and the NFL Network online. Is it wrong to share a login? Depends on whom you ask. I haven’t seen an official word from any of the companies mentioned above, so I guess you proceed at your own risk. Recent rulings in a password sharing case may result in this being deemed illegal by the courts, so check your local laws before sharing passwords. 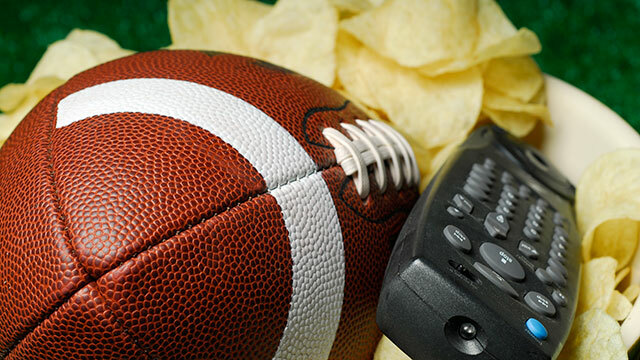 For many football fans, NFL Sunday Ticket is the be-all, end-all. However, you generally have to have DirecTV to get it… except there are a couple caveats. If you live in an apartment or condo where you can’t have a satellite dish, DirecTV will sell you a streaming version of Sunday Ticket. But it isn’t cheap, at $69.99 per month. If you happen to be a college student, you’re in luck: You can get the same service for only $24.99. That’s a little easier to swallow. You can find out if you’re eligible here. Happen to be a Verizon customer? Or maybe you’re considering changing wireless providers? Then you might have the cheapest option of all. Verizon customers can stream every NFL game of the season using the NFL’s mobile app. All at no cost. That’s right, if you’re a Verizon customer, free NFL comes with the service. As you’d imagine, there’s a catch. It’s only available on your mobile device. So you can’t the stream to your television. But if you don’t mind watching on your phone or tablet, this might work for you. Amazon will broadcast 10 Thursday night games in the upcoming football season to its Prime members only. Amazon Prime costs $99 a year, but of course that gets you free two-day shipping, music streaming, and on-demand shows and movies, as well. CBS and NBC will also air the 10 Thursday night football games Amazon will broadcast. Whether you choose good old-fashioned bunny ears or one of the many options you have if you want to watch sports online, one thing’s for sure: It’s cheaper than paying $100 or more per month for cable. Chris Brantner is the founder of Streaming Observer, where he provides crucial info for people to find the content they want, like NFL football without cable. You can also find his blogging expertise on Scribblrs.com.